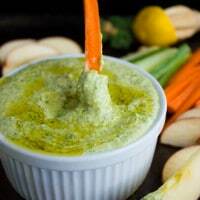 Embrace your inner green goddess with this Vegan, Gluten-free Garlic Kale Hummus Dip! It’s a healthy, high-protein snack perfect for any time of the day. It can also be served as an easy appetizer to share with friends. This garlic kale hummus dip recipe is a power boost to the good old hummus! It’s the same texture, same taste, same satisfaction, but plenty more goodness! Kale is sauteed for 20 seconds with garlic and a pinch of salt, then blended with chickpeas, lemon juice and tahini for the ultimate green goddess hummus dip! This Garlic Kale Hummus Dip is a MUST try recipe. And while it feels like a continuation of the DETOX vibe going on around here (which started with this Mexican style lentil detox salad ), it’s actually just a continuation of delicious stuff. The detox vibe will end up being yummier than you think—so don’t miss out! It’s no secret we all LOVE hummus!! I usually prefer a good old classic like this ultimate hummus dip and use it a base recipe when I feel like flavoring it up —like with mashed sweet potatoes or avocados, roast peppers, roast garlic etc. 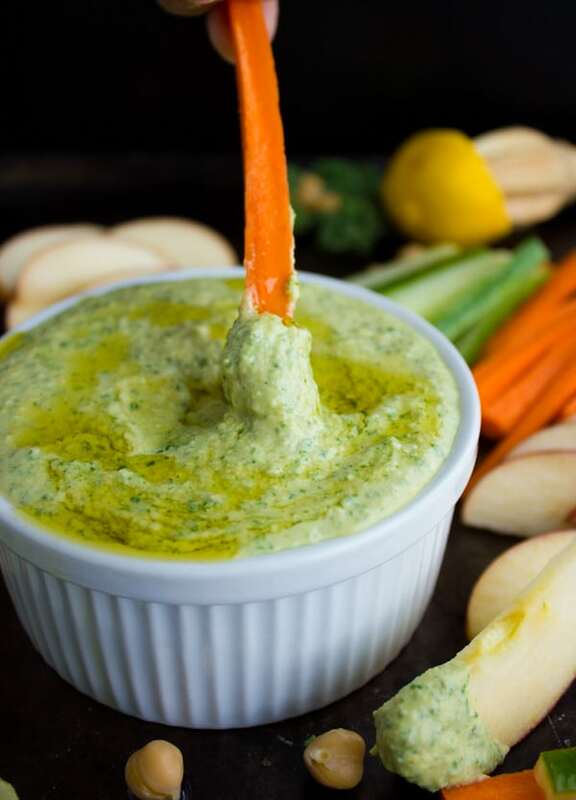 One of my fave flavor options for hummus is this garlic kale hummus dip: A super flavorful, healthy yet creamy and smooth hummus dip that’s both vegan and gluten-free. And it involves superfood kale. I tend to talk a lot about my love for kale and use it many recipes around the blog here. It has a pleasantly bitter taste, a nice chewy texture, and is just good for you, so it’s absolutely worth giving it second and third chances. 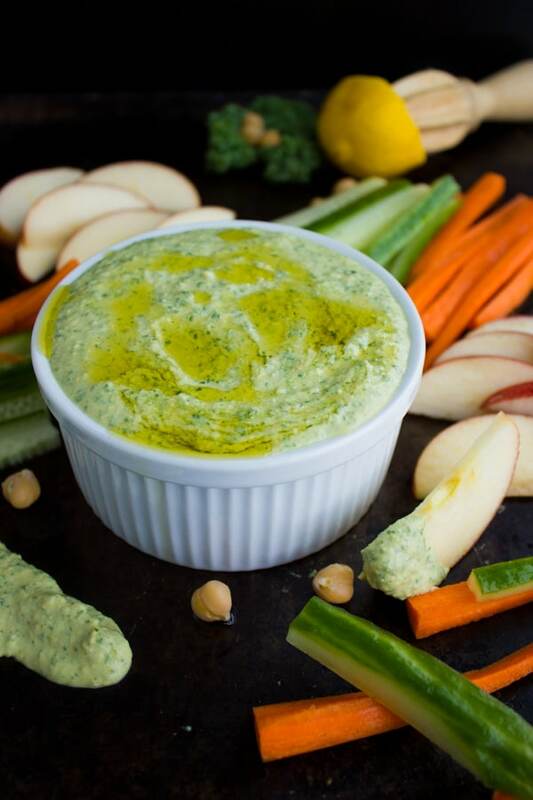 This garlic kale hummus dip makes the perfect game day dip this season! A perfect healthy lunch, a great appetizer for any meal and a fabulous high-protein snack anytime! Kale obsessed or not, you will love love love this hummus dip! To make this AMAZING garlic kale hummus dip, I start by adding 1/2 teaspoon of olive oil to a hot skillet and then dump in the sliced garlic and chopped kale leaves. I sauteed that for exactly 15-20 seconds with a pinch of salt. The kale softens up and wilts slightly, while the garlic becomes super fragrant. For the record, I’ve made this hummus recipe with fresh kale and fresh garlic and found the flavor slightly too strong. Plus the fresh kale gave my food processor a harder time. I follow the exact recipe I described in this ultimate hummus dip because it really is the best recipe! A perfect balance of chickpeas, tahini, tang, salt and smokey cumin, with a secret ingredient: olive oil! It adds a ton of flavor and ultra smooth texture! So after the kale is quickly sauteed, it goes into the processor with all ingredients and a few mins later (depending on how strong your food processor is) you’ve got yourself a silky smooth, perfect hummus dip that can be enjoyed right away or stored in your fridge for at least 2 weeks! If you prefer a completely raw hummus dip or a stronger kale feel and taste in your hummus go with fresh leaves. 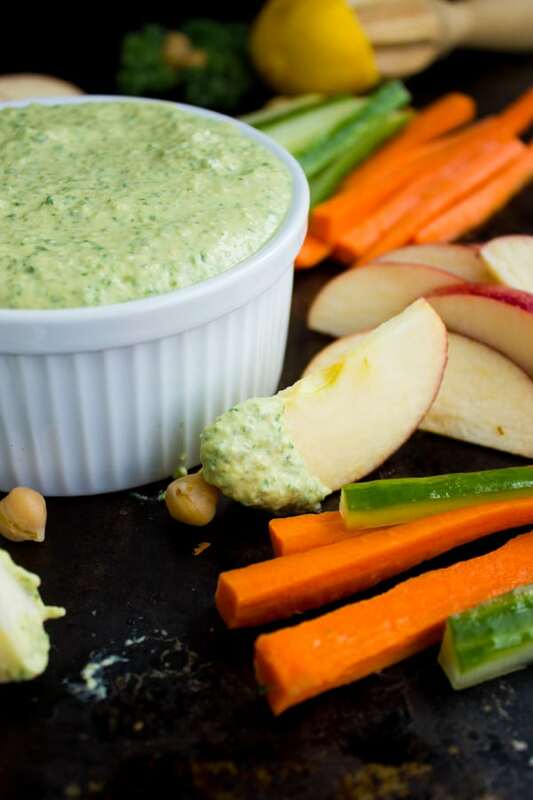 Serve this hummus dip with your favorite veggies or crackers—my absolute favorite accompaniment would be apple slices. Turn this hummus dip into a dressing by adding some more olive oil, lemon juice and a tiny splash of water and blend until you have reached the desired texture. If you’re looking for some inspiration on using more kale, try some of these recipes : kale mushroom brie pizza, kale veggie mini frittata, quinoa kale stuffing with squash rings, kale pesto stuffed mushrooms, healthy kale squash mushroom pasta. 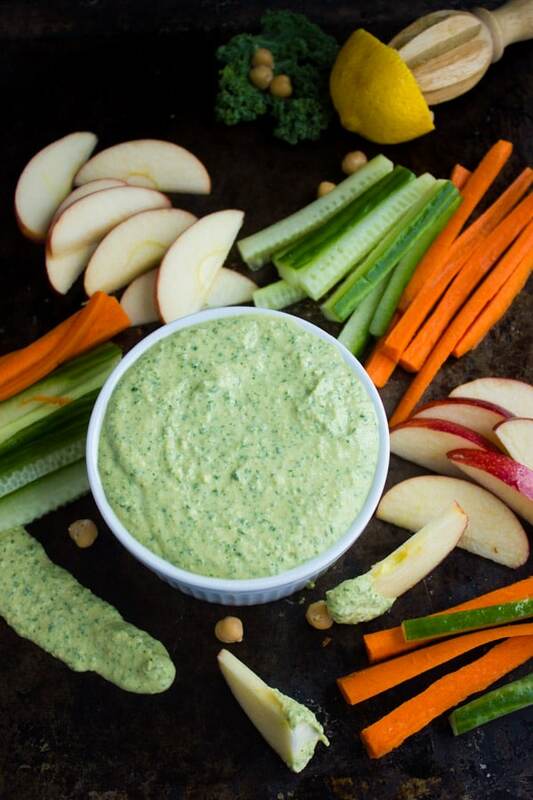 Embrace your inner green goddess with this Vegan, Gluten-free Garlic Kale Hummus Dip! It's a healthy, high-protein snack perfect for any time of the day. It can also be served as an easy appetizer to share with friends. Preheat a skillet over medium-high heat. When the skillet is hot, add in the olive oil, garlic and kale. Season with a pinch of salt. Sauté the kale for about 20 seconds until it starts to wilt and shrink to about half the amount. 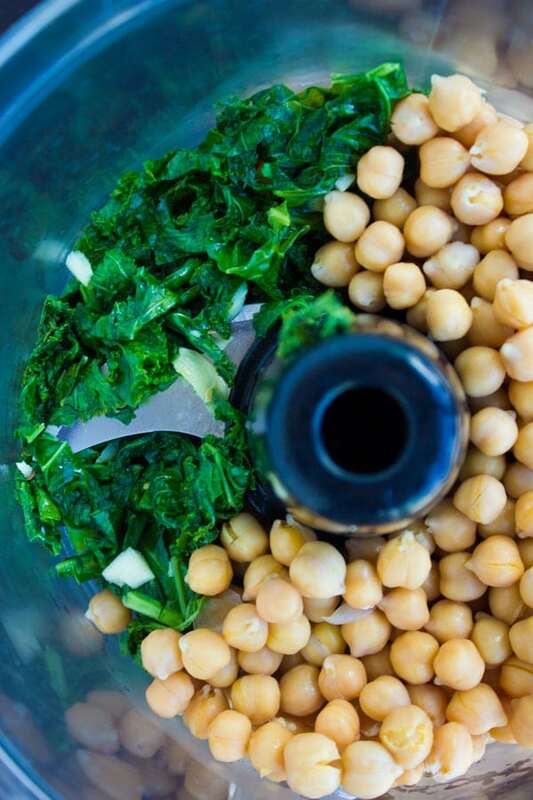 Add the garlic kale mixture into the food processor along with the remaining ingredients and pulse until smooth. Serve with your favorite crackers, fruits and veggies. Love the combination of garlic, kale and hummus! Great photos too. This hummus looks fab Mahy! I love hummus but to be honest most of the time I try not to have too much of it in the house because I just end up eating it all and normally the shop-bought stuff isn’t the healthiest. But I love that this is full of good stuff so I can eat it and not feel guilty! Oh Erika, this stuff is SO good for you–you can eat as much of it as your heart desires! 🙂 Hope you make it–it’s much more flavourful than store bought stuff I promise! Another great use for kale! Never thought of putting it into my hummus. Yum! Thanks Lindsey–you’re very sweet! 🙂 I think you will absolutely love this hummus! Thanks Anita, you will love this twist and your diet will love you back 😉 Enjoy! Yay! Another way to eat kale, instead of constantly roasting it in the oven like I do 🙂 I love hummus and kale both so this recipe is probably going to be made every weekend in my house. 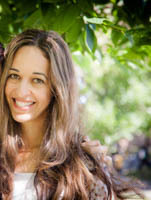 Karrie–you will love kale and hummus even more now! 😉 Enjoy!